I am sure that every person in this church has heard the expression: “I’m Spiritual but not religious”. Which in our culture is code for “I don’t need to go to church, I don’t need to be part of a community, I don’t need to talk about or show my faith in public to, you know...be OK with the man upstairs”. What is wrong with this statement of “spiritual but not religious” is that it takes two ideas which are a complement of each other and makes them opposite. It presents the lie that we can have one without the other, when in reality one cannot exist without the other. 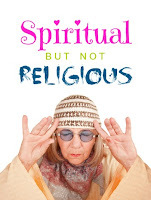 If we are truly spiritual, religion will flow from our own existence since at its most basic core religion is just the way we live and express our spirituality. So a spirituality without religion is like a flower garden with no dirt, no plants and no flowers. I am not really sure where this idea comes from. The one thing I am sure is that it is the complete opposite of what the Lord Jesus expects from each one of us, as his followers. And there is no clearer passage in the Gospels to prove this point than the reading I just proclaimed a few minutes ago. Today’s Gospel reading is one of Jesus most remarkable sermons, so remarkable that it even has its own name...The Beatitudes. Here Jesus gives us a list for how we, his disciples, are to live our own spirituality, and how are we to know that we are on the right path towards becoming more like him. First as disciples of the Lord it is key that we realize we are “poor in spirit”. It really doesn’t matter how spiritual we think we are, at a spiritual level we can never be anything more than “poor”. In fact, the more we deepen our spirituality, the more aware we will become of how much we lack in our spirit. So the real spiritual person is one who knows how poor of spirit they are. As his disciples, we also have to realize that suffering is a part of life, and that it is OK to mourn for our sufferings and the sufferings of others. But most importantly, we need to understand that our consolation from suffering doesn't come from material things. As disciples of the Lord, he is the only one who can console our hearts, and this is what gives us the power to console others. As spiritual people we have to be meek, we have to be gentle, we have to be willing to serve others in quiet submission. Pride is the great sin, it is the source of all sins. The only way we can defeat our own pride is by humbling ourselves. Only then we can be worthy of the gifts he has promised to those who follow him, only then we will inherit the land. True spiritual disciples hunger and thirst for righteousness. They live lives which follow a moral code given to us by God and not by the changing fashions of the day. Truly spiritual people reject sin, and not only sin but even the potential occasions TO sin. To be spiritual we need to hunger and thirst, not for what gives us pleasure but what is good, right and just, even if its is difficult. Our spirituality needs to be merciful. It doesn’t matter how much or how hard we pray, if we do not practice mercy towards others, our spiritual life is dead. Spiritual people live their spiritual life among those who need mercy the most. Spiritual disciples are clean of heart, they rely on God’s forgiveness to remove the stain of their sins. They don’t go to the sacrament of reconciliation, they run!! They constantly take specific steps to seek God's forgiveness and never think that sin is not important, or that God doesn't care about it. And finally a healthy spirituality brings peace, but not the temporary peace we get from material things. The peace we get from Him is a peace we can not keep locked for ourselves, it needs to be shared with others. Spiritual disciples are agents of healing and reconciliation in a world in which division and hate are the order of the day, and they bring peace wherever they go. Now how are we to know if we have a healthy spiritual life? Jesus gives a very simple answer to this question: If we are persecuted for being his spiritual disciples, if we are insulted, if the world utters every kind of evil and falsely accuse us because the way we live our spirituality, the way we show our religion. If the people at school, at work even in our own houses, think that the religious practices which flow from our spirituality deserve jokes, ridicule even hatred and persecution, rejoice and be glad because we we are on the right track to become true disciples of the Lord.